Yves/mountain guide and ski instructor in charge of tree climbing in Morillon, Celine/plastic arts teacher. High quality and luxury chalet; tasteful decoration, spacious outdoor spaces without fences. Chalet in good position, a short drive to ski lift. Good hosts, very informative on arrival. The chalet itself was of a satisfactory standard. We were a party of 8 adults and 2 children ( chalet can sleep up to 12) We found the living accommodation a bit tight for us all and very little space in the kitchen area when we were all sat at the table. The kitchen itself was well equipped. The bedrooms were adequate however the beds very hard and somewhat uncomfortable. Finally two toilets for a chalet this size is not really sufficient. Ein wunderschönes Haus mit allem Komfort .eine tolle Sauna. Auch ansonsten ist alles was man braucht vor Ort. Eine gute Aufteilung der Räume ebesno geschmackvoll eingerichtet und alles sehr sauber. Rund um War es für uns ein toller Aufenthalt. 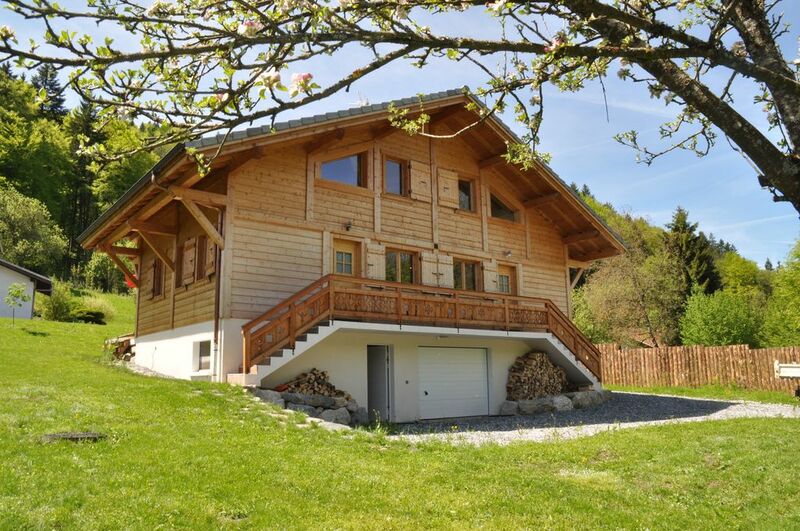 We au top dans ce superbe chalet familiale. Il y a tout ce qu'il faut. Il est grand et spacieux. Les 3 douches sont bien pratiques pour aller plus vite! La literie est impeccable. Les remontees mécaniques pour atteindre les pistes sont à 5 min en voiture. Mooi chalet voor ca 10 personen. Kleine vaatwasser, groot terras, 2 grote ovens. Kinderen konden leuk sleeen bij het huis. Met 5 minuten rijden ben je bij de skilift van Morillon. Wifi was wel traag. Het was een fijn verblijf. Goede communicatie vooraf met de eigenaar en aardige mensen. Het huis ligt iets vanaf de openbare weg, maar goed bereikbaar en heeft een ruime eigen parkeerplaats voor minimaal 4 auto's. Prima uitgangspunt om de piste te bereiken. We waren met 9 personen in deze woning en er was voldoende ruimte, een gezellige houtkachel en ruime keukenvoorzieningen. De loopruimte in de keuken is wel een beetje krap. Er was ook voldoende warm water voor de douches en dat is wel fijn na het skiën. Bedankt Celine en Yves. In winter: 3 minutes shuttle on foot to the ski resort, Ski Resort of Grand Massif: At 4 km - quiet hamlet, various sporting activities in 5 minutes: Paragliding, tree climbing, hiking, climbing, mountain biking, rafting, horseback riding, water skiing and arts activities at 700 m: School holidays training courses organised by the association “arts tes en herbe” (budding arts) Lake: 1 km - River: 0.8 Km – Shops and villages: 3 and 4 km - cities: 52 km from Chamonix, 72 km from Annecy, child care at owner’s home; 100 m from the rental. Other activities: Morillon tree climbing, Golf: Aqua golf of Samoens and Golf Flaine, Ski: Ski Resort of Grand Massif in 5 minutes, Ski Resort of Fond d'Agy in 15 minutes, Ski Resort of Fond le Praz de Lys in 20 minutes and Les Portes du Soleil Ski Resort in 30 minutes.